Earth radiation is used as a collective term for some of the forms of energy that is studied and detected using Rod divining. 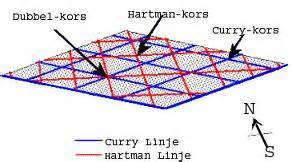 Curry-, Hartman- and Ley lines are some of the specific patterns that you may have heard of. Earth radiation often forms various line systems and lattice, reminiscent of an interference pattern. Apparently the Earth radiation is a kind of wave phenomena. Knowledge of these wave phenomena is described far back in our history. One example is from the 1500s when search for mineral deposits in Sweden was important. Many of the metal mines have been located with help of rod divining. Earth radiation may affect humans, animals and plants in various ways. The basic idea is that you should avoid staying a long time in strong Earth radiation fields. Many people have probably heard that you should not have your bed over an underwater stream or over a Curry line cross. The builders of old cottages and farms must have had the knowledge of Earth radiation, because many houses have been built so that Curry line crosses are tangent at the building’s corners. In this way, everyone avoid sleeping or placing furniture associated with Earth radiation crosses in the house. Is it possible to protect yourself against Earth radiation? Yes, there are some things you can do. We have developed an Earth radiation protector in the form of a small plate. This plate is placed on the floor in an apartment or a house. The plate seems to remove all known forms of Earth radiation fields.